2014 was a big year for Scotland, certainly in more than one way, but particularly where renewable energy is concerned. 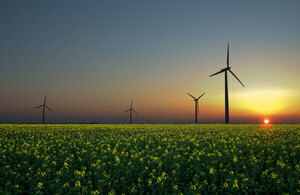 The amount of energy the country generated from sustainable wind power broke record after record consistently throughout the year. For Scottish people, December saw an astounding 164% of the average household’s electricity requirements met by wind generated energy. This staggering achievement came just a few months after an already impressive record in October, when 126% of electricity needs were met. For the entire year of 2014 as a whole, an amazing 98% of Scotland’s domestic energy requirements were met with renewable technologies. Considering that the winter of 2014 was particularly cold – with some news reports going as far as calling it ‘Arctic’ – the feat of rising to meet energy demand is all the more impressive. It has been suggested that Scotland’s wind energy success relied largely on the extreme weather and high winds that the UK experienced in 2014, such as that caused by the effects of Hurricane Bertha’s passing over the Atlantic Ocean. But, even on the less windy days, wind power still managed to supply over one third of electricity requirements to domestic homes in Scotland, according to WWF Scotland director Lang Banks. 2014 was an important year for renewable technology and energy all over the world, and Scotland established itself as an unlikely leader in this global energy transition. Perhaps throughout 2015 and into the future, the rest of the UK will begin to follow Scotland’s impressive lead.